Allegra Boverman/Gloucester Daily Times. 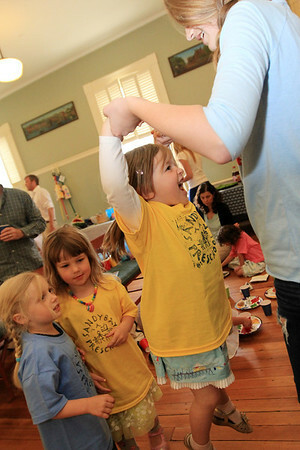 Emma Twombly, 13, right, plays with Lucy Mae Whelsky, 4, and friends, behind her, Cecelia Chadbourne, 3, left, and Maggie Olson, 4, following the younger girls' graduation from Sandy Bay Preschool of Rockport on Tuesday. The event was held at Community House.